iTunes can take up a great amount of space. Offline songs particularly take up storage space, with most taking up to 1 gigabyte each. So if you own up to 400 songs offline, that’s 4 gigabytes. And that’s just the beginning. Except for iTunes media, there are still lots of space-gobbling data like old backups, used update files, cache, cookies, logs, etc. The data count can rise pretty fast. The whole works can take up to 70 gigabytes. Excluding your songs! Getting rid of this data can take a lot time, especially if you’re doing it manually. And the longer it stays, the more space it takes up. What you need is a one-stop solution that allows you reclaim all the space you want at your leisure. Why Does iTunes Take up So Much Space? The amount of space that iTunes takes up can make you wonder exactly why it occupies so much. The space iTunes takes up is largely attributable to its media files. Songs particularly take up a lot of space and it can get pretty vexing if a lot of them are songs that you don’t listen to. Old iOS backups are accumulated. This means that your old backups aren’t deleted. They just sit there on your hard disk, occupying space and doing nothing for your device. Your used iTunes and iOS software updates files are also stored on your hard disk. Even the mere act of running iTunes creates junk files like caches, temp files, cookies, logs etc. which not only takes up space but also influence iTunes performance. Depending on how busy you are, you could devote some time to cleaning up useless files from these folders. You have to do this manually though. And frankly, you don’t want to do this as it has a lot of disadvantages. For common users, it can be hard to detect which files are useless. If you don’t know which to delete, you might end up getting rid of those useful files that your iTunes needs to perform optimally. iOS backups created by 3rd-party apps are not even stored in these folders. This means that you have to go find these other backups by yourself. It’s not only time-consuming but also vexing to sit and try to do all of this manually. Instead of manually removing unwanted iTunes data and making decisions about what to delete, it's much easy to use iMyFone TunesFix - the world’s NO.1 iTunes cleaner. To completely clean up iTunes space, you just need 3 simple steps without deciding which to delete and which to leave untouched. Automatically remove useless iTunes files, like cache, cookies, logs, temp, and junk files, releasing space and speeding up iTunes. Delete accumulated iTunes files: used iTunes/iOS software updates. 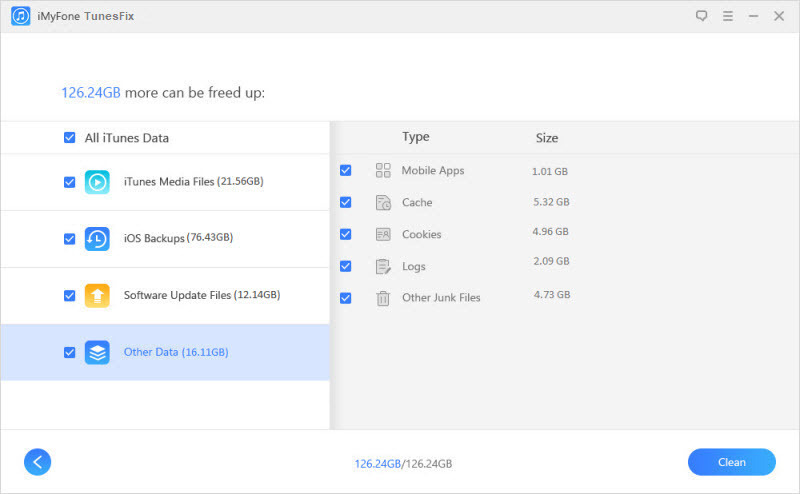 Clean hard drive space by deleting iOS backups, also including old backups created by 3rd-party software. Remove iTunes media files from media folder and iTunes library, depending on your needs. Handle any errors or issues when you use iTunes. Step 1: Have your PC opened iMyFone TunesFix. It immediately detects your iTunes. If your iTunes is damaged, you can click "Repair" to fix it. Or you'll see the home interface. Note: If you like to do further cleaning for your iTunes, like to remove hidden backups, select “Deep Clean” mode. But note that it will take more time to scan and clean. Step 3: The scanning process won't take you much time. When it's done, check the uuseless files and click “Clean”. TunesFix will clean the selected files from your iTunes. When it is done, it will show you how much space has been freed. Rather than run the risk of corrupting your essential iTunes media files when you delete them manually, save your time and your iTunes by installing iMyFone TunesFix. 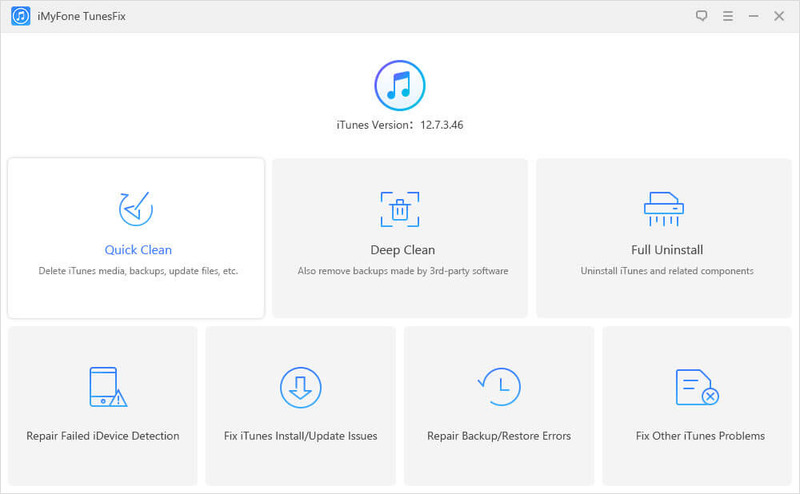 With TunesFix, you can clean up your iTunes quickly and easily and repair all your iTunes issues all in one app.